Welcome to The Obsidian Pebble Blog Tour! 11-year old Oz Chambers lives in a haunted house (Penwurt). His mother wants to move, but Oz would rather do double algebra (yuck) every day for twelve months than leave. Where others see spooky, Oz sees wonder and mystery and aching reminders of his deceased dad. When he and his friends hear ghostly footsteps in the boarded-up dorm at Halloween, it leads to an exploration of the old place's eerie reputation. In his Dad's locked study, Oz finds a parcel addressed to him and posted the day before his father died. Inside is the obsidian pebble, the link to all of Penwurt's astonishing secrets. Suddenly Oz begins to change; he goes from maths dunce to A student overnight and has to deal with suspicious teachers and jealous pupils. 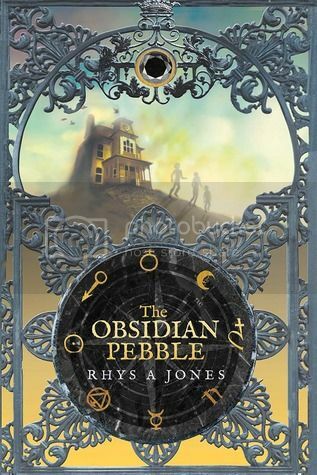 But the footsteps in the locked rooms don't go away and slowly, Oz begins to knit together the strands of lies and mystery that tie the obsidian pebble, his father and him together. What Oz hasn't bargained for is that he's not alone in that search for understanding and that solving Penwurt's puzzles lead to other, much darker secrets that will test his loyalty and his bravery to the limit. Today I get to welcome Rhys for an interview!!!! I'm super excited to have him here, so say hello and read what he has to say! I did always want to be a writer. Unlike 99% of my classmates, I enjoyed writing essays when I was in junior (elementary) school. But, like the majority of writers of my generation, the creative side of my brain had to take second fiddle to getting an education. Because I also wanted to be a doctor. Lots of years of study meant that the writer in me just grumbled away in the background. But he would not go away. I tend to compartmentalize, and so when I finally got all the qualifications I needed, I let the beast out of its cage. Now I am both a doctor and an author. No regrets. Great question. I’ve started writing the date in my notebooks so that I can look back at when the first word hits the page so that I can answer this sort of questions. The ideas come first and they often sit on my Mac or in a notebook for months—occasionally years. But from brainstorming the ideas and making sure they have the legs to go the full length of a novel until it’s there in a draft form on the PC, ready for maybe someone else to see, is 9 months. Bit like having a baby! But then, of course, (and unlike a baby) I will leave it in a drawer for me to forget, so that I can try and read it afresh a few weeks or months later. And I know I will go through it least another half a dozen times before the reader or my editor are happy. I write for myself. When I write Middle Grade, I’m writing for me as an 11 or 12 or 14 year old. I suppose I’m lucky in that I can still remember what it was like to be that age. And I have three children. But I was, and still am, thrilled by strangeness, the supernatural and what still might be possible. Science fiction and fantasy is what melts my butter in terms of where the ideas come from. If you are asking specifically about ‘themes’ as opposed to story ideas, we’re talking here about the big ideas that are explored in fiction. The things that are important to us all like loyalty and friendship and betrayal. They are constants, big ideas, and weaving them in, without them flashing up in great big green neon, is what writing is essentially all about. I get up early. I have a day job, I’m a practicing surgeon (and yes, if I keep on practicing, one day I’ll be good at it, I’m sure), so 8-6 I’m busy with that and I am occasionally on call. So between 5 and 7 every morning, I will write something. I am at my best with a cup of tea at my elbow, having walked the dogs, in my writing room greeting the dawn. I will often go over what I’ve written in the evening, trying all the while not to laugh. It’s slightly easier now that the children have become young adults. They don’t live at home any more and so the Rhys Jones taxi service is on hold. Being a doctor and being out in the world meeting all sorts, and I mean all sorts, feeds the creative side. Though I do have to admit, sometimes when I’m in the zone, having to leave the world my mind is in for a clinic can occasionally be testing. However, over the years, I’ve learned to keep all of these activities in mental boxes. Oh, and I have a very understanding wife. A Predicament readers can empathize with. A Mystery . The need to know is pretty primal in us all. I’d rephrase this question as ‘What is the hardest thing about writing a book?’, because it doesn’t get any easier. The only thing that gets less stressful, having written several books, is the confidence you gain from knowing that you will eventually get to the end. A point at which there is no more to say, or punctuate, or polish. For me, the hardest thing is slowing down and not rushing it. I plot all of my stories so that I know how they all end before I begin. There is a great tendency to rush the middles to get your protagonist to that final confrontation. But if you’re not careful, you miss a lot of fun in the middle. I have published 5, but The Obsidian pebble is the first real MG, the others were very much adult books under a different name. But I have also written four of the 5 which make up the Artefact quintet already, in various draft forms. And my favourite is always the one I have yet to write because, like all good mysteries, that’s the one that excites me the most. I’m going to pass on that one. I have an author’s den. It’s outside of the main house, built so that I can go and hide and not be disturbed. It’s really a garden shed, but it has power and is quite cozy in the winter, besides providing homes for a variety of sparrows and wasps throughout the summer. Now and again a squirrel clambers over the roof. It does so usually when I’m at a tense, scary bit of writing so that I, too, can experience cold clammy sweat on the back of my neck when peace is shattered by a set of scrabbling claws. I’m beginning to wonder if it peers in through the window and reads the screen so that it knows…. It is a circuitous one. I first published The Obsidian Pebble myself to test the waters. I got lots of nice reviews on Amazon and realized that MG readers quite often prefer to see and look at a book in a shop. I also realized that, unlike a lot of adult books, MG books are often bought for the readers by parents, or recommended to them by librarians and the like. We needed to take a different route where we could get some distribution. Spencer Hill seemed the ideal people to work with. So here I am. Yes, but I tend not to ask them to beta read. One of them studied English literature, one is a producer/musician, and one a software developer, so they all have very different tastes and are not shy with comments. My brother in law, when he read Pebble, thought it reminded him very much of what it was like to be at school again. I liked that. We have dogs. I like walking them. I also walk the hills and the coastal paths we have here in Wales. This is the only country in the world where you can now walk around the whole of the border. We’re very lucky. And as we all know, ‘all truly great thoughts are conceived by walking’. I didn’t say that, a chap called Nietzsche did. And he certainly knew a thing or two. Write for yourself, in the genre that you enjoy the most. Read extensively within that genre. Read books on how to write, but not too many, and take the best bits from those books to hone a technique, and fashion tools that work for you. There is no correct way, just the way that works for you. Writing the story is pure imagination, fashioning it to make it the best that it is, is technique. I would strongly advise Writing Fiction for Dummies and The Snowflake software for story outlining. They are a great start. Favourite book. Has to the The Lord of the Rings. Probably because I read it when I was 14 or 15 and it just opened up a whole new horizon to me. Authors, there are more than one. I read James Lee Burke—who is an adult author of gritty American crime. But I also read Brandon Sanderson, Neil Gaiman and JK Rowling within my genre. The inspiration for me has always been Ray Bradbury. Something Wicked This Way Comes, is a book I go back to, time and again. No, I’m pretty much a loner when it comes to writing. I don’t do critique groups, and now, working with SHP, I do have access to a great Beta reader and lots of editorial input. Always. The 4 books to follow Obsidian Pebble in the Artefact quintet are a work in progress. I am also writing for adults, contemporary urban fantasies with a dark and humorous lilt. I have to write. It’s what keeps me sane. Thanks so much for stopping by today, Rhys! It was super great having you here with us! Award winning author (OMG) Rhys A Jones writes fantastic, funny, scary (is this a bit too presumptuous? By fantastic I mean fantasy, not brilliant--though I hope they are--brilliant that is), mysteries for ages 10 and up. His job is to take you where anything is possible. When he isn't writing he walks the dogs and occasionally practices medicine. He lives in an evergreen valley in West Wales with his very understanding wife. I just wanted to say thanks a billion for letting me drop by. I really appreciate it. And if anyone has any questions, I will do my best! ACK! Thanks for being here! It was so much fun to do your interview! Cheers! So, first off thanks for posting about this book! Second off, why do I want to read this book? Well, I have a younger brother that hates reading, which is kind of like blasphemy to me because I live and breathe books. Every time I get a middle grade book, I always have to share it with him and let him know how truly amazing each and every book is. Slowly but surely I can see the spark of interest starting with him. So now I not only want to create interest for him but help all siblings and parents who have kids that look at books with disgust know that there are books out there that can start their kids reading. And I think that one of those might just be this book. So that's why I want to read it. Sorry for the long sordid explanation! I do this with my oldest son! I get middle grade reads and read them and love them and then see if he'll want to discuss it with me. But he knows the only way he can do that is to read it, too! I want to read the book because I love the cover. This looks like it would be a great book for my oldest daughter! She is 12 and I have the hardest time finding books that will hold her interest and the cover is awesome!! I hope she likes it. Lisa Amowitz does great awesome. Doing the interview was great fun. The Contessa asks some tricky questions, too! My apologies for delays in replying, it's this pesky transatlantic time difference (6am in the UK now). Let me know if you enjoy the book. You'll know where to find me! Thanks again for hosting me Brooke. I have heard lots about you and I'm sure we'll meet up one day. It was a pleasure! And you've heard about lil' ol' me? I hope it's been good! And I do hope to meet you one day for sure! Thanks for being here!